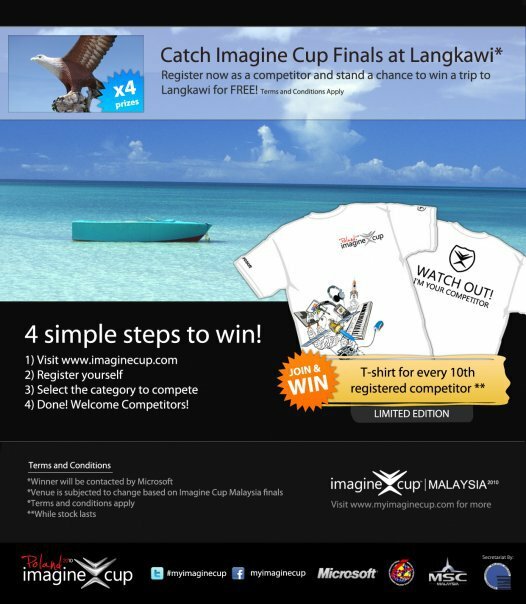 Finally, Microsoft at Malaysia confirm that they will held Imagine Cup 2010 Malaysia Final at Langkawi. For the past 3 years (since year 2007 until year 2009) as I know, Imagine Cup Malaysia Final always held at KLCC. This is the first time Malaysia final is held outside of Kuala Lumpur and it is a tourist spot, Langkawi! Hurray! It should be fun having party with other competitors at beach after all the tough preparation for competition. It sound like Imagine Cup worldwide where students having party almost everyday. Imagine Cup is not just about programming and presentation, it also include a lot of fun elements! Party! Unlike Imagine Cup worldwide, you must be one of the finalist in order to get the ticket to travel to there, but Imagine Cup 2010 Malaysia is giving out 4 tickets to non-finalist competitor to visit Langkawi for free. What a good holiday plan + learning trip on semester break! It order to win this great prize, all you need to do is just register as a competitor at Imagine Cup worldwide website, and register the category you interested. Simple enough? Besides, every 10th registered competitor will get a free Imagine Cup t-shirt for free. I personally also encourage competitors to submit their work to the category their interested and stand a chance to win a trip to Poland as well. Remember to go through the award as well. I guess Imagine Cup 2010 Malaysia finally going to have so much fun. I wonder I have the chance to have fun together with others as well. Envy you all man. Really?all non-finalist competitor can go to langkawi too?what a good news! !but isn’t non-finalist competitor here is stand for those who being selected as representative of an university but not being selected to be top 30 teams ? Yes, all non-finalist competitors stand a chance to go as well (limited places). Not sure how is the selection process going, but let us see how it is go. Envy you all got the chances! Yeah~thanks,Keng Siang.hope that i have a chance to go thr! haha..it’s really a good experience!